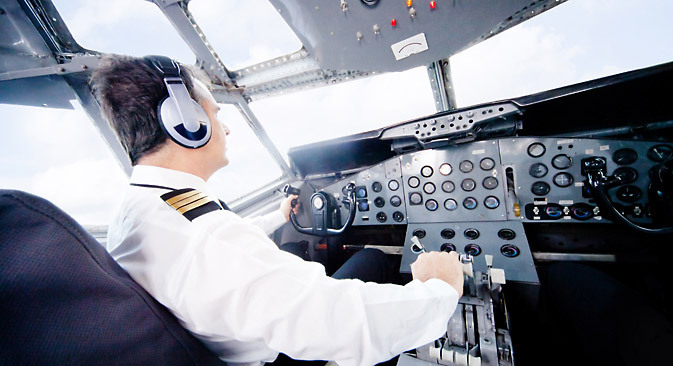 Foreign pilots will be allowed to fly in Russian cockpits as captains starting in 2014. Russia’s largest airlines, Transaero and Aeroflot, are already prepared to hire 270 foreigners, with wages at 400,000 rubles ($11,200) per month. The upper house of the Russian parliament – the Federation Council – has definitively resolved to invite foreigners to serve as captains at domestic airlines. Amendments have already been made to the Russian Air Code to allow for this change. According to the explanatory note attached to the bill, the Russian aviation industry as a whole needs to replenish its flight crews by 1,100-1,200 people per year, with a shortage of captains a particular problem. In order to hire foreigners, Russian air carriers will have to annually submit an application to the Russian aviation authority Rosaviatsia, specifying the type of aircraft. In total, companies will be allowed to hire no more than 200 foreign captains per year. The mechanism for distributing quotas has yet to be determined, but demand already far surpasses these limitations. A representative of Aeroflot said that the company is ready to hire 200 captains – the maximum number of foreign pilots permitted under the quota. According to Aeroflot’s research, total demand for foreign pilots in Russia reaches roughly 800 people. Transaero, meanwhile, is looking to hire up to 60-70 foreign captains a year, a representative of the company said. Meanwhile, a representative of Russia’s third-largest airline – S7 – said that the carrier is not experiencing any pilot shortage and has no plans to hire any in the near future. Aeroflot first started talking about the need to allow foreign pilots onto the Russian market in the summer of 2011. When the bill was being discussed in the State Duma, it was said that temporary measures were being planned for the period until 2019. In all likelihood, Scandinavian pilots and captains from the Baltic states will be most interested in the opportunity, as they are required to pay an income tax of up to 50-60 percent, Deputy General Director of Region Investment Company Anatoly Khodorovsky said. Has Pavel Durov been fired as CEO of Russia’s largest social network VKontakte? According to the Aeroflot website, Russia’s largest airline currently pays Airbus A320 captains up to 400,000 rubles ($11,200) per month. In addition, the benefits package includes housing, visits to health centers, and compensation for training. New pilots also receive up to 400,000 rubles in material aid after signing on with the company. “It has been a long time since air carriers invested a single ruble in training air crews, instead opting to use the ‘legacy’ of the Soviet era and retired military pilots. The state pilot training system has also collapsed during that time,” Finam expert Alexei Zakharov told RBTH. Aeroflot opened a pilot school several years ago, although it only trains co-pilots, he said. As a result, Aeroflot has an excess of co-pilots and a shortage of captains.